June 10th, 2007: Here we are in Havre, Montana, in a pretty spiffy campground right downtown. Tomorrow we plan on taking a tour of Havre which includes something called Havre Underground. Sounds like something like the tunnel tours in Moose Jaw. We had high, gusting winds Thursday and Friday. In fact, it gusted so hard one time that it ripped our awning off close to the motor home, and lifted the arms enough that they unlatched and swung out at about a 45 angle. We didn’t notice it, but a passing car flagged us down and stopped to help us fasten it up again. When we got to Saskatoon, we just took it off completely and stored the hardware at Lloyd’s place. Good thing we didn’t try to pass a truck with those arms stuck out! We stayed Thursday night in Saskatoon, just parked in front of Lloyd’s place. We got away from Saskatoon Friday afternoon, after Doreen’s appointment, and drove as far as Kindersley, where we just pulled into the Wal-Mart parking lot. We were scheduled to meet Cathy, my sister, at Maple Creek Saturday night, so there didn’t seem any point in rushing. With that wind, two or three hours of driving was all I wanted. Saturday was coolish but free of wind, and what a difference it made to driving! We had a delightful lunch at Tea & Tassels on First in Eatonia, a tea room and craft and antique store in an elegant old house just a block off the highway. Business was slow as it was grad day in Eatonia, so we were able to visit with the owner, Donna, and her sister, Laurie. Highway 21, which had been pretty fair from Kindersley to Eatonia, got pretty rough from there to Leader, but they were working on it. We had been down this way last summer, so we didn’t take time to visit the sculptures in Leader, but if you’re down that way, don’t miss them! 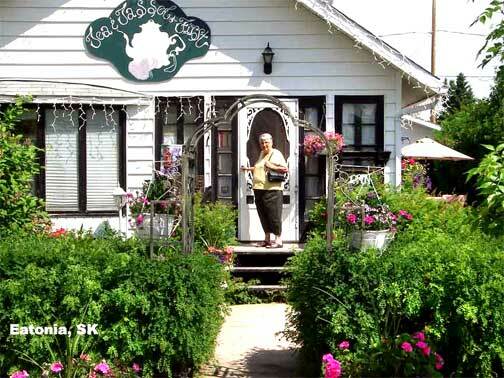 Seventeen kilometers south of Leader is Spruce Creek Antiques, a very interesting and clean place. Watch for the sign on the highway, though, because it is in a farmyard a couple of hundreds off the highway and easy to miss. It is owned by Wayne and Deb Wenzel and we had a chance to visit with them. We stayed at the Willow Bend Campground right in Maple Creek – lovely, level sites with lots of shade where it counts, and full services. An excellent campground! By the way – we noticed campgrounds in Eatonia, Leader and Fox Valley; I suspect there aren’t many villages that don’t have some facilities now. Seeding is all but finished in south-western Saskatchewan, though a heavy rain did slow some down. Back at home there were several families of geese using the beach. 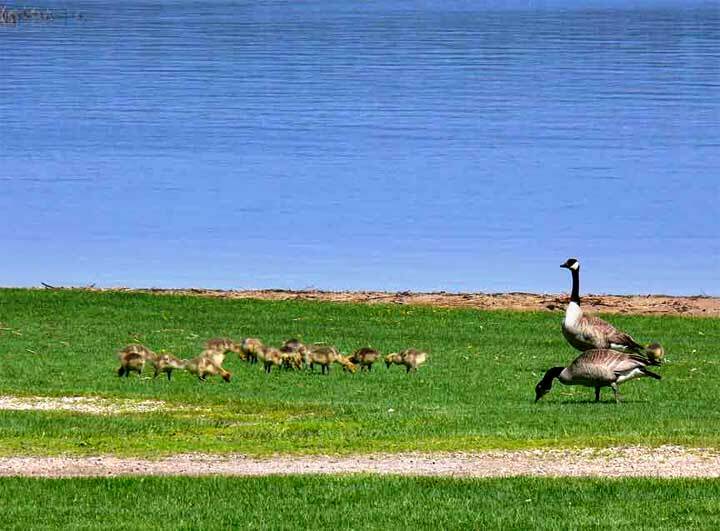 One couple just had two goslings, but I got a photo of another pair with fourteen! The locals think one pair was babysitting for another pair who were off feeding; I gather they do that. Or maybe the moms are babysitting while the dads are off playing poker! I forgot to mention that the Willow Bend Campground is right beside the main line CPR, and the horns blew as they went past. They were annoying when we were trying to carry on a conversation, but we didn’t hear them at all during the night. Must be our railroad past! We enjoyed Fort Walsh. We took a tour, and the guides made it fun and interesting. They grabbed three kids that were in our group and made them temporary constables of the NWMP. The kids had to arrest various miscreants among our group for fraud, possession of alcohol, and horse theft. There was a trial later, and a swearing-in ceremony for the kids. They were all decked out in red jackets and pillbox caps. They kept the caps but had to return the jackets. They had a ball! The road from there to Willow Creek, at the Border, were all gravel but not too rough, and there was almost no other traffic. We had to boogie because the US Border Station closed at 5PM. We made it with time to spare, and were in Havre by six.